Osaka, Japan (November 13th, 2018) – Software Cradle Co., Ltd., part of MSC Software a Hexagon Company, today announced the latest release of its technology leading CFD (Computational Fluid Dynamics) software scSTREAM v14.1 and scFLOW v14.1. Building on the v14 Cradle CFD releases of earlier this year the v14, these represent a significant milestone for MSC and Cradle. The first major CFD product releases as part of the MSC portfolio of solutions, they generated tremendous interest in the market and extremely positive feedback about the significant competitive meshing and solving performance improvements seen, and by some of the exciting possibilities gained from bringing together some of the industry's most respected CAE simulation solutions. "In some cases we've seen competitive meshing benchmarks where we've been over 100x of times faster than some of our more traditional CFD competition. When coupled with 3-4x faster solve times this is a significant benefit to our customer's processes. In other instances we're able to simulate models our competition has simply not been able to deal with. As a result, we're seeing tremendous interest from MSC customers, who want more return on investment and being included with MSC One is a bonus for many MSC customers!" says Masayuki Kuba, President and CEO of Software Cradle Co. Ltd. The v14.1 release continues MSC Cradle's pioneering leadership with a variety of usability and processing speed improvements allowing users to perform daily tasks better, and in a way that allows CFD applications to contribute more to product design and development. Unique, Industry Leading, Multi-Physics Co-Simulation Gets Stronger. 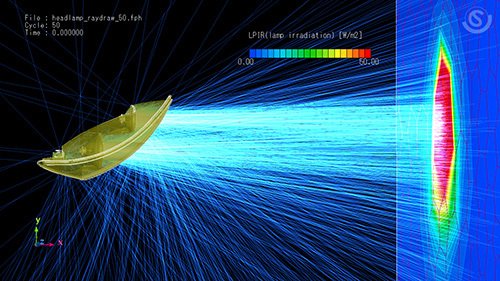 Co-simulation capabilities within v14 of Cradle CFD have established MSC's leadership position with co-simulation capabilities for multi-physics CAE. V14.1 sees updates to the co-simulation possible with scFLOW: Adams 2018.1 and Marc 2018.1 and now supports a greater array of customer's conditions and use cases. V14.1 sees the introduction of a cutting edge new functionality for lighting simulation for both scFLOW & scSTREAM. An extension of the advanced radiation functionality MSC Cradle has had for a number of releases, MSC Cradle CFD now enables customers to undertake quantifiable lighting simulation, including graphical ray output, as well as support for semi-transparent and/or porous materials. This is a very powerful tool for automotive lighting applications. Cut cell meshing improvements mean scSTREAM is now more capable of dealing with extremely thin shapes and thin walls, providing greater model fidelity and user productivity benefits with minimal mesh increase. In addition to extended support for MSC Nastran and Marc, MSC Cradle Post visualization is also now compliant with HTC VIVE, enabling users to integrate VR simulation environments on a far more extensive range of devices, for Cradle CFD as well as MSC Nastran and Marc. Emphasizing this release, Masayuki Kuba, President and CEO of Software Cradle Co. Ltd, said: "Demand for CFD is increasing in relation to the growing indispensability of CAE applications for product development and design. We're now moving faster than ever before to meet that need. CFD solutions are expected to deliver fast, accurate simulations of complicated physical phenomena and this is what we are providing to our users in these V14.1 releases." Software Cradle is one of the five original CFD (Computational Fluid Dynamics) companies being founded in 1984 in Japan. It is recognized to be one of the technology leaders in CFD with its scFLOW (polyhedral meshing based CFD), scSTREAM (hexahedral meshing based CFD), and SC/Tetra (tetrahedral meshing based CFD) suite of software products for all applications. In blind and open benchmarks, its products have been proven to be both fast and accurate in the CFD space with speed ups of up to x4 versus traditional CFD codes. With expertise spanning all industry sectors and market-leading co-simulation capabilities when coupled with other computer-aided engineering packages, Software Cradle products allow users to design and develop products fast and accurately, yielding significant productivity speedups, time-to-market improvements and returns on investment. Software Cradle Co. Ltd. was acquired by MSC Software Corporation in 2016.